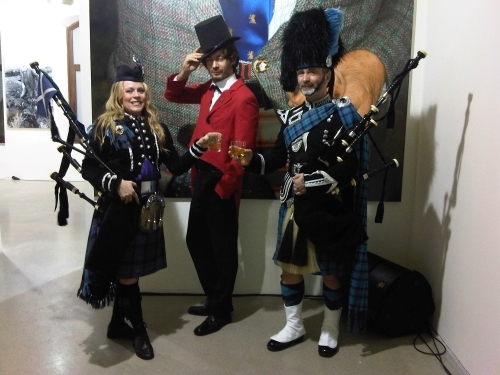 Piping in guests at the Edinburgh International Film Festival 2012 annual ceilidh! Held at the Surgeon's Hall, Edinburgh, 23 June 2012! 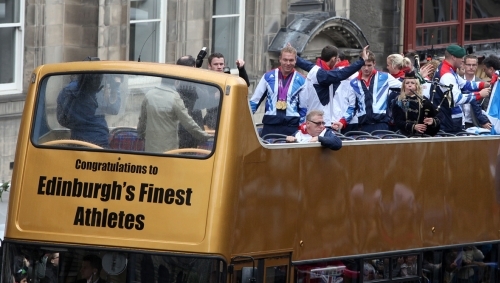 So honoured to pipe for Sir Chris Hoy, GB's greatest Olympian ever, along with all our Scottish Olympians and Paralympians on the open-top bus as we paraded through the streets of Edinburgh! 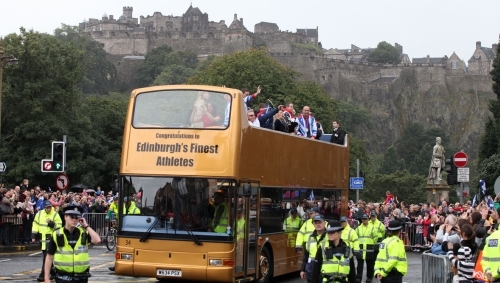 Despite the heavy rain, 30,000 spectators came to watch and cheer as we travelled from Edinburgh City Chambers to the Assembly Rooms, where Sir Chris was given the 'Freedom of the City' by the Lord Provost of Edinburgh - 16 September 2012!! Congratulations Sir Chris Hoy and our Scottish Olympians and Paralympians! Edinburgh is so proud of you! A day I will never forget! So proud to perform for all our amazing athletes and then pipe Sir Chris Hoy on stage at the Assembly Rooms (playing Chariots of Fire), when he was awarded the Freedom of the City!!! 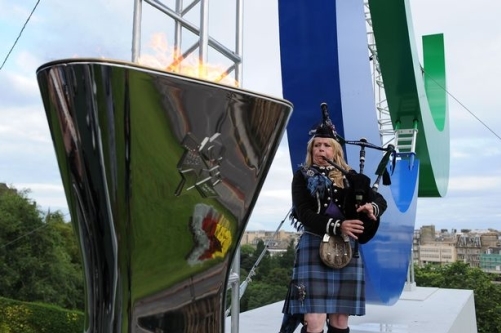 Piping at the lighting of the Paralympic flame, on the Mound, Edinburgh. On Sunday 26th August 2012! Getting ready to pipe the Paralympic flame into Edinburgh Castle! With a member of LOCOG! 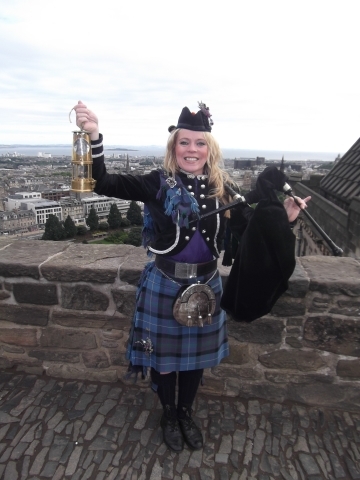 And here I am in Edinburgh Castle - carrying the Paralympic flame!! This was a proud moment!! 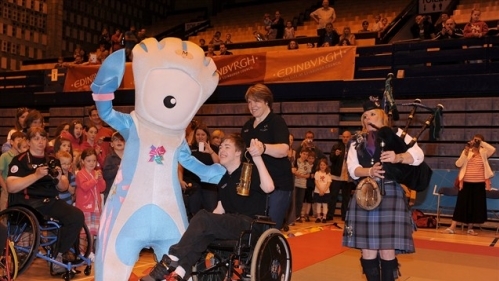 Piping the Paralympic flame into Meadowbank Sports Centre, Edinburgh! Fantastic day - 26 August 2012! Piping with Craig and Charlie, the one and only 'PROCLAIMERS'!! They enjoyed me playing Proclaimers tunes on the pipes for them as well as wearing my Hibs tartan especially for them!! June 2012! 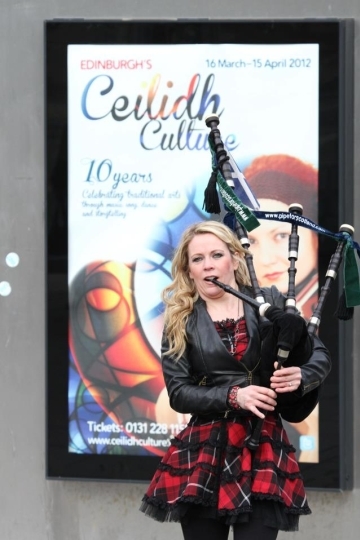 Piping at the Launch of Ceilidh Culture at the Usher Hall in Edinburgh on behalf of the Cify of Edinburgh Council! Celebrating the launch of Edinburgh's music, arts and culture festival, February 2012! 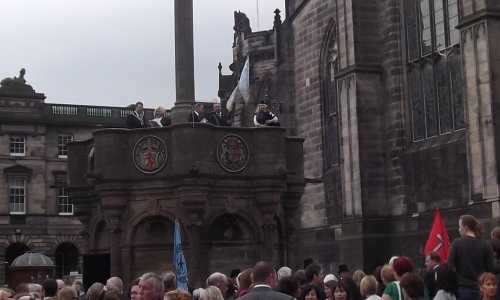 Leading the Lord Provost of Edinburgh from Edinburgh City Chambers to the Mercat Cross on the Royal Mile. About to welcome 250 horses and riders at the Edinburgh Riding of the Marches 2012! And here we all are on top of the Mercat Cross! Awaiting the arrival of the 250 horses and riders - Edinburgh Riding of the Marches, September 2012! Piping at a wedding at the Signet Library, Parliament Square, Edinburgh! Piping for Hearts FC - winners of the Scottish Cup 2012! 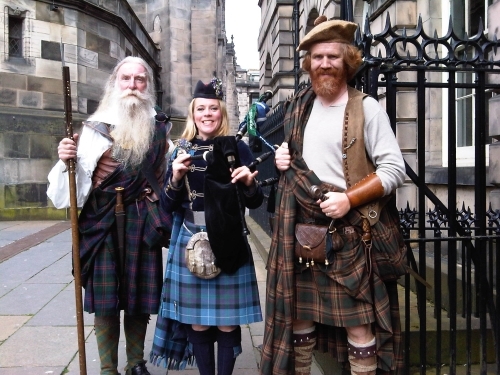 I piped the team into Edinburgh City Chambers on behalf of the Lord Provost of Edinburgh! Piping in Istanbul, Turkey on behalf of Diageo!, March 2012! Pictured here with my piping colleague Mike and 'Johnnie Walker'!! Piping at the Edinburgh Moonwalk, June 2012. 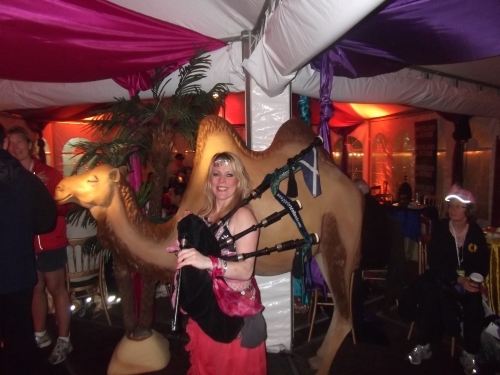 This year's theme was 'Midnight at the Oasis' - hence me being dressed up as a pink bellydancer/piper!! Pictured here with a camel before performing on stage in front of 12,000 Moonwalkers!! 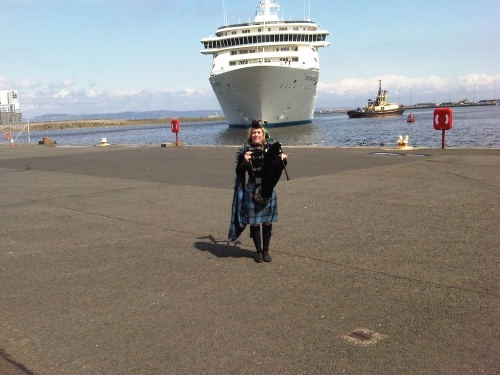 Piping at the Launch of the cruise liner season in Leith! 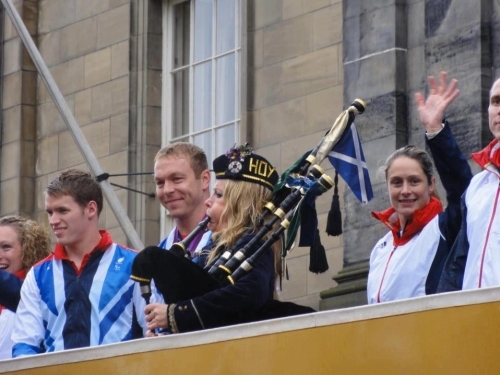 Piping at the launch of the Olympic Rings, June 2012 at the National Galleries of Scotland, Edinburgh. 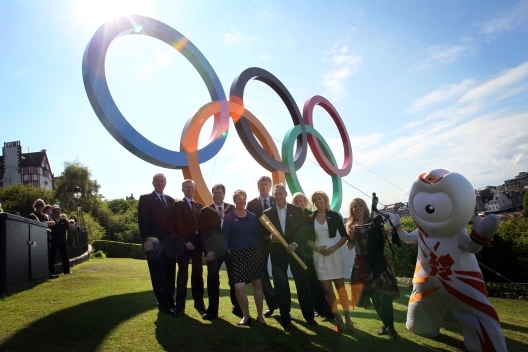 Pictured here beside our very own Allan Wells MBE, former Olympic Gold Medalist! Performing 'Sunshine on Leith" and 'Walk 500 Miles" on Radio 4 with the Proclaimers!! 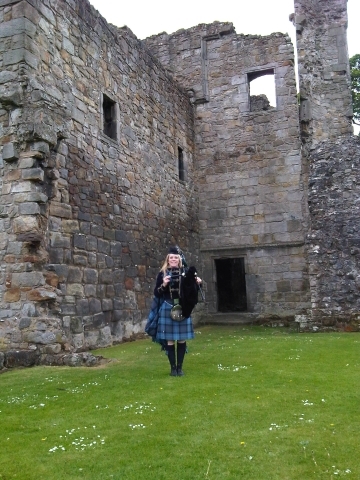 Piping at a wedding in Fife, Scotland! Welcoming the arrival of a cruise liner in Leith on behalf of Forth Ports Ltd. 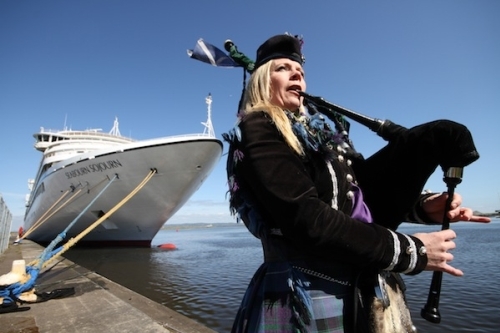 I am thrilled to have provided Scottish music entertainment for the arrival of all cruise liners in Leith, Rosyth and South Queensferry from 2007 to 2012!! 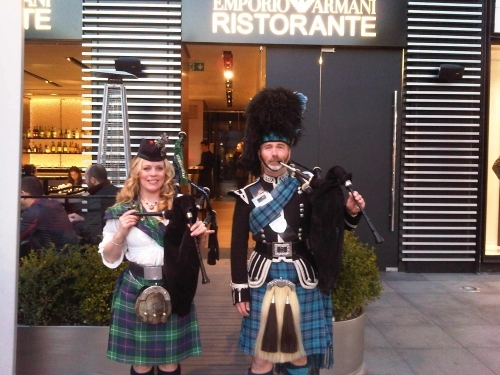 Piping in Istanbul, Turkey, at the Johnnie Walker Whisky Festival, March 2012!! Pictured here with my piping colleagues, Mike and Glyn, as well as 'Captain Morgan' and his assistant! 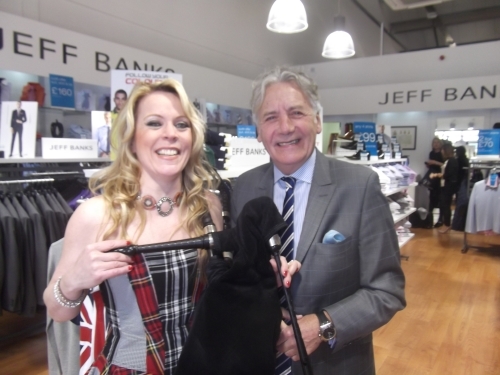 Here's a wee photo of me with top British designer, Jeff Banks CBE, as I piped at the opening of his new store in Gretna, May 2012! It was lovely to pipe at Gretna again for the first time in years!! Piping at a wedding in Edinburgh! We had the most amazing time piping at Istanbul Whisky Week, March 2012! Piping at the Sky Fame Awards Ceremony, March 2012! 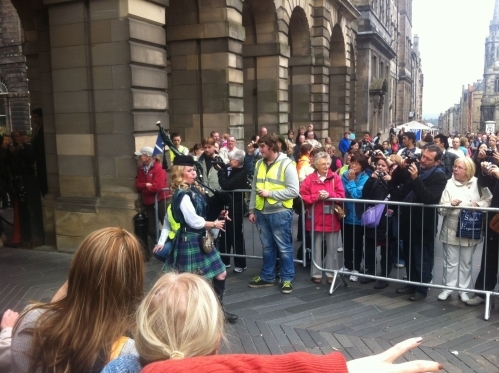 Piping in guests outside the Royal Museum of Scotland!! 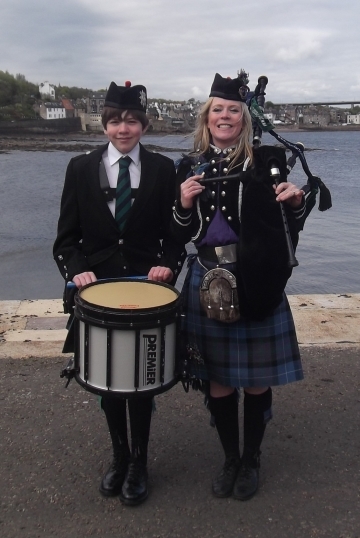 Piping for the arrival of a cruise liner at South Queensferry, Scotland on behalf of the City of Edinburgh Council! Pictured here with Rory the drummer!!! Performing at the launch of the 'Johnnie Walker Whisky Festival, Istanbul, March 2012! Alongside top Grade 1 pipers, Tony, Mike, Camay, Glyn and Pete!! We had the most amazing time! 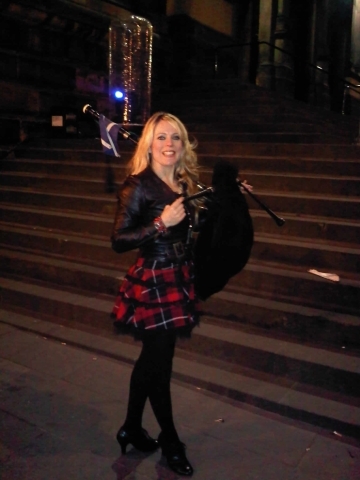 Piping at the launch of the Edinburgh Moonwalk! Raising awareness of breast cancer in Scotland, March 2012! 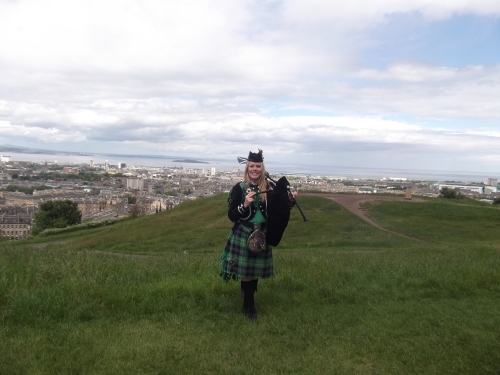 Piping on Calton Hill, Edinburgh, June 2012! Pictured here with Scottish presenter Grant Stott! 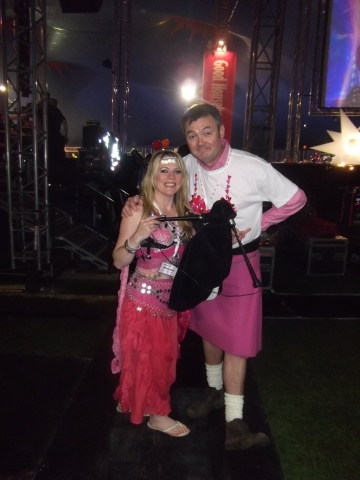 At the Edinburgh Moonwalk 2012 - raising awareness of breast cancer in Scotland! Piping at the Edinburgh Moonwalk 2012 - see www.walkthewalk.org! Alongside the amazing Moonwalk Bellydancers! 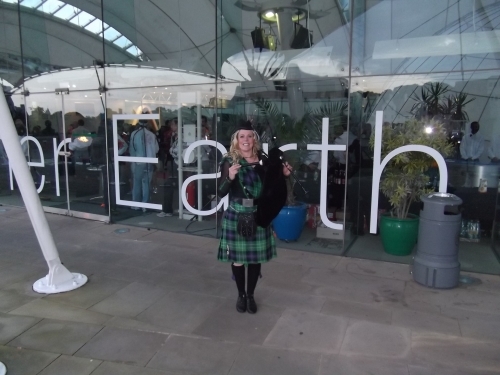 Piping at Dynamic Earth, Edinburgh! 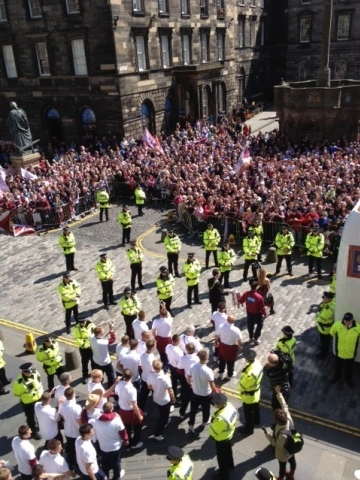 Leading the Lord Provost of Edinburgh and Hearts football team onto their open-top bus with the Scottish Cup 2012! Proud to have piped for both Edinburgh's football teams, Hearts and Hibs FC, on behalf of the Lord Provost of Edinburgh! Well done also to Hibs for reaching the Scottish Cup Final 2012!! Piping Hearts FC onto their open-top bus parade in Edinburgh! Filming a bagpipe lesson and Whisky tasting session with 'Sky Travel'! 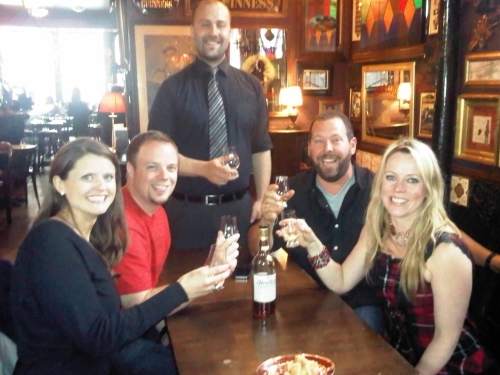 Pictured here with American TV presenter Bert Kreitscher, along with 2 members of the show and of course our Whisky expert - Rory from the Whiski Bar, Royal Mile, Edinburgh! 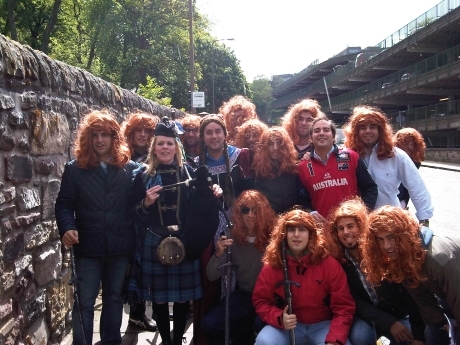 Piping a handsome group of Spanish Rugby supporters from the Grassmarket, Edinburgh to Murrayfield Rugby Stadium! The lads of course stopped off at a few bars on the way for a wee refreshment! Great fun!! Getting ready to go on stage at the Edinburgh Playhouse with the wonderful 'Pulse of the Place Samba Band' at Edinburgh's Got Talent! 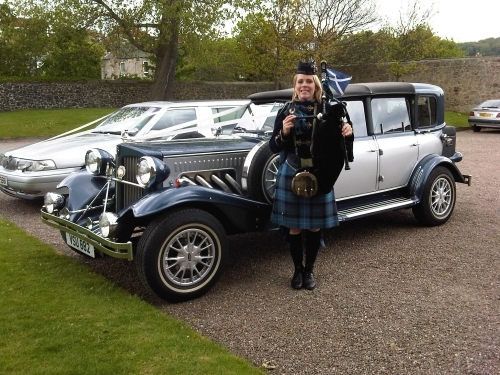 Piping at the launch of the new Jeff Banks Store in Gretna Green, May 2012! Piping for our lovely 'bride and groom'!